As my son is getting older, and more aware of the different types of food I put in front of him, he is becoming quite skilled at eating around the veggies. Now there are some veggies that he loves and will eat no matter what, but others will end up on the floor or left on his tray. As a result, I sneak the other veggies into his food by mixing them into muffins or meatballs, etc.... I do secretly feel like an evil genius when he's eating said muffins and meatballs and loving them. I'm definitely doing the evil "HA HA HA" laugh in my head thinking how I got him to secretly eat the veggies. Now onto the muffins. I made a discovery about a month ago when I was baking bread and realized I didn't have all the veggies I wanted to put in it. I went to my pantry and grabbed a baby food veggie pouch and put it in the batter instead. The bread came out moist and tasted like the veggies in the pouch! Seriously one of the greatest baking discoveries I've made! So much easier to use the veggie pouch, especially when you're short on time caring for a toddler. 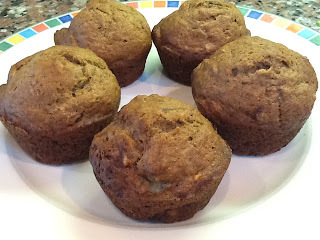 With the muffins, I used mashed banana, and then 1 Plum Organics zucchini banana pouch. If you can't find that one you can use any pouch or baby container with squash or spinach, or puree your own zucchini if you have time. These muffins are for little ones 10+ months who are ready for finger foods. Preheat oven to 350F. Mix flour, salt and baking soda in a large mixing bowl. In another bowl, stir together butter and brown sugar until it gets creamy. Add mashed banana, zucchini, and egg to the brown sugar and butter mixture. Stir until smooth. Add banana mixture to flour and stir until well combined. Lightly grease a muffin tray, and spoon the mixture into each slot on tray (one to two spoonfuls per slot). Place in oven and bake for 20 - 25 minutes. Let cool, serve and enjoy! Do you think I could add protein powder to the mixture since my daughter refuses all types of protein? Why not? Give it a try! I'd maybe add maybe a little more butter or a tsp of oil (whichever you like) so they won't be dry, or more veggie puree. Let me know how it turns out. I've never baked with protein powder, what a great idea!